"Good moving colt with a great attitude. Bred on the SNITZEL/TALE OF THE CAT cross that has 77% winners to runners. I also trained the mother FAIRYTALE BELLE who was underrated and I thought enough of to run in stakes races," - trainer Steve O'Dea. SPILL THE BEANS (AUS) (Bay 2012-Stud Aust. 2016, GB 2018). 5 wins-2 at 2-from 1100m to 1400m, A$560,700, BRC QTC Cup, Gr.2, ATC Eskimo Prince S., Gr.3, Hawkesbury Guineas, Gr.3, 2d Scone RC Inglis 3YO Guineas, L, City Tatt's RC Brian Crowley S., L, 4th ATC Hobartville S., Gr.2. Half-brother to SW Kenedna (VRC Matriarch S., Gr.2). Out of a half-sister to SW Yammer. Closely related to SW Speak Fondly (ATC Flight S., Gr.1). His oldest progeny are yearlings. FAIRYTALE BELLE, by Real Saga. 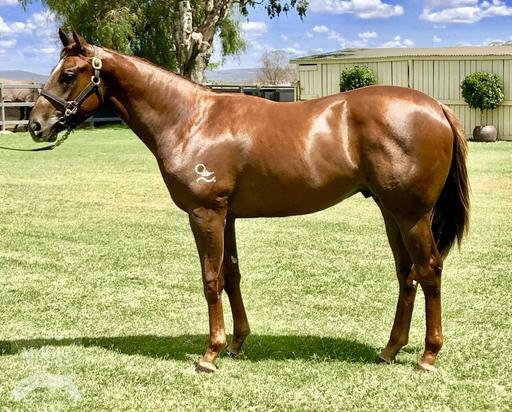 2 wins at 1200m, 1800m, BRC Bollinger H., 2d BRC Mittys H., 3d BRC Bundaberg Distilling Company H., Simmons Bakery H. Half-sister to Dance on Board, Orbiting Belle. This is her first foal. Dance on Board (Fasliyev). 7 wins-1 at 2-from 1200m to 2200m, A$266,820, MVRC Alcoa Wheel Products H., Findon Harriers Hunt Club 2YO H., Broome Cup, 2d MRC Jayco Cup, L, Snitzel H., 3d MRC Le Pine Funerals Cup H., VRC Altona H., Geraldton TC Batavia H.
Curvature (Snitzel). 5 wins-1 at 2-to 1400m, A$122,550, S$294,505, to 2018, Singapore TC Hello Dubai S., Better Than Ever S., Super Easy S., Class 4 H., 2d MRC Inglis 2YO Premier, RL, Singapore TC Stewards' Cup, L, VRC Bay & Ranges 2YO H., Singapore TC Class 2 H., 3d Singapore TC Kranji B S., Celebration S.
Fairytale Belle. 2 wins. See above. Mina Harker. 3 wins from 1400m to 1900m, A$78,514, to 2018-19, ATC TAB Highway H., 3d ATC TAB Highway H.
Bellegano. 2 wins at 2, MRC Elaren Security Services 2YO H.
Brouhaha. 2 wins-1 at 2-at 1000m, 2050m, 2d MVRC Melbourne Signage Concepts Inglis Bonus H.
Hampton Girl. Winner at 1000m in Aust. Russian Knight. 8 wins-2 at 2-to 1400m, A$75,170, QTC Manawapoi 2YO H., 3d QTC Young Carbinier H., BTC Polyam H., Show a Heart H.
Casse Cou. 3 wins-1 at 2-at 1200m, 1600m, 2d MVRC Final on Big Screen H.
Little Jo. 7 wins from 1200m to 2050m in Aust. Das Boss. 3 wins at 1100m, 1200m in Aust. Flying Belle. 3 wins. See above. Swift Arrow. 2 wins at 1200m, 1400m in Malaysia, 3d Singapore TC Charity Trophy, Class 5 H.
Eyota. Winner at 1500m in 2017-18 in Aust. Petite Diablesse (Denon). 4 wins to 1400m, A$119,375, VRC Building Engineering H., 3d VRC Vanity S., Gr.3. Le Commandant. 11 wins to 1400m, A$243,555, Alice Springs TC Pioneer Sprint. Coup de Vent. 3 wins to 1400m in Aust. Take Liberty. Winner at 1400m in Aust. Cecilia. Winner at 1100m in Aust. BICHETTE (Bellotto). 3 wins. See above. Grand Ranch - Triumphant Venture (Mal.) (Rancher). Placed in Aust. and Malaysia, 3d SAJC Fulham Park P., L, Weatherly H.
Where the Boys Are - Ma Chao (Mal.) (Bellotto). 2 wins at 1200m, 1400m in Malaysia, 2d SAJC Euclase H., 3d SAJC Balcrest S., L, 4th SAJC Fulham Park P., L.
Corrado. 4 wins from 1000m to 1600m in Aust. Boule Miche. 4 wins-1 at 2-to 1450m in Aust. Jangadeiro. 3 wins from 1200m to 1600m in Aust. MICHOU, by Summer Fair. Unplaced. Half-sister to Lemon Butter (dam of COOL TED). Dam of 9 named foals, 7 to race, 4 winners.